Time and space seem to be part of each other’s DNA, woven into the thought process. So when you have someone who travels through space, but is a time lord, you’ve got every cause for fantastical adventure covered. I’m one of those terrible people who came into Doctor Who with the series reboot, and I did not force myself to become a completist. Listen, there is a lot of media out there, and when I think of all the years of good TV throughout history my head explodes, and this is why I can’t handle watching Star Trek even though I’d love it, and also I don’t have to explain myself to you (although apparently I do). Anyway, I started Doctor Who with my first and still favorite Nine, and have kept it up to varying degrees of enthusiasm since. Doctor Who is an alien, so a lot of the episodes have that space-oriented bent, but I love the time travel elements. Particularly when they go into the past—seeing the way the writers get to play with history, inserting the Doctor and alien elements and twisting these great events for modern storytelling, it’s a thrill. Doctor Who likes to play with the other end of the time spectrum, waging guesses on what the future might hold, but for now I want to focus on my personal favorite past-dated episodes. If that’s not enough to sate your Time Lord thirst, I’d highly suggest finding your own favorites on this ridiculously comprehensive interactive map of all the Doctor’s time travels. Welcome to your own lost time. But wait for that, because, and without any further ado, I present my favorite time episodes for each modern doctor. During his all too brief run as the Doctor, Christopher Eccleston had a surprisingly amazing selection of time traveling episodes. It might have been Davies coming out of the gate strong to reintroduce the character and concepts to the viewing public. Whatever it was, it was marvelous. I almost went with “The Unquiet Dead” here, out of Dickens love and how wonderful Eccleston plays in that time period. And “Father’s Day” is one of those thoughtful, heartbreaking pieces that majestically sets the tone of the Doctor and his limitations. But in terms of sheer staying power, “The Empty Child,” an eerie mystery set during the London Blitz, wins hands down. For one, it deserves major props for introducing everyone’s favorite scandalous chap, a certain Captain Jack. And for another, this had visuals and a narrative that established the new generation’s particular brand of doing good with a slight edge. “The Empty Child” changed the way I look at gas masks. 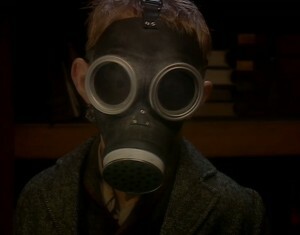 I dare you to hear the phrase “are you my mummy?” without getting the chills. Oh, David Tennant. The most beloved of all, his time larks were many and varied. Whether he’s charming Madame de Pompadour, infuriating Queen Elizabeth, or solving mysteries alongside Agatha Christie, Tennant’s Doctor has no qualms with sticking his nose into history and muddling around in the past. Which is why it’s so surprising that my favorite time episode barely features the Doctor. It might be low on the titular character, but “Blink” stands supreme as a great Doctor Who episode and a terrifying use of time travel. Even I can’t begrudge giving Stephen Moffat his due with this one. The man did good, even if he can’t carry a series-long arc to save his life. 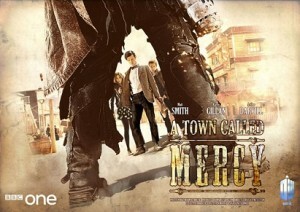 But this one-off is Moffat at his finest. 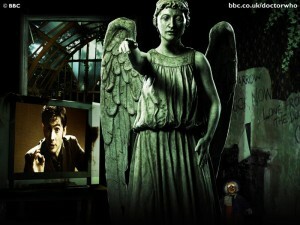 There’s a crazy intricate premise, with the introduction of the time-distorting Weeping Angels. There are crazy high stakes, since one touch from the angels zaps a victim back in time, never to return. Together, those elements create a classic Moffat episode, a single idea just interesting enough to captivate and devastate anyone watching. There are better episodes and better uses of time—including the Weeping Angel-centric “The Angels Take Manhattan”—but it’s only natural that my list would navigate towards my own personal interests. After all, I was nearly tempted to call “The Shakespeare Code” a top Ten episode, my love of the Bard almost edging out my complete distaste for Martha (and seriously, how awful is her mooning over the Doctor in that episode?). I’m a complete sucker for Western aesthetics, so placing the Doctor within that no-holds-barred world absolutely delighted me. I thought it was a good way to show times clashing against each other, and the cyborg thing was pretty dang cool. But what I really loved about this was the way it captured the spirit of moral ambiguity that is the trademark of Westerns. In a wild world, who can truly judge? This is another example of my own personal biases tilting the scale towards this episode. I’m a complete Robin Hood fan. It was my favorite Disney movie growing up, I read the stories over and over until my copy was tattered (but I’d always stop before the end, while the gang was still fun and before sorrow and betrayal), and when the BBC made their own series I was an intense fangirl. 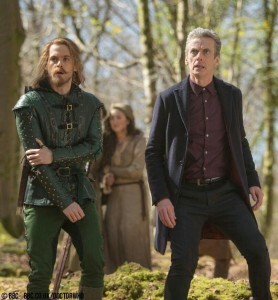 So it stood to reason that I would love the Doctor facing off against my dear Sir Robert. I would also argue that this is one of the first episodes with Peter Capaldi that fell into a rhythm with his new Doctor, getting comfortable with who he was and how he interacted with the world. Everything up to it felt like introduction. This is how the age thing works, this is how he works with Clara, and this is how we’re going to use him and say goodbye to Eleven just a little more. But with “Sherwood,” we got a glimpse of a comfortably caustic nature and slight egoism that felt more lived in. All the reassertion that Robin Hood is no creation, but actually as lovely and brilliant as I always dreamed? Just the icing on an already wonderful cake. Writer, teacher, arts enthusiast. Lover of TV and sandwiches. Tagged time, TV. Bookmark the permalink.